Just to add another input on this subject. I have been having the same issue for weeks now, after updating from 3.3.1 (which worked fine) to 3.6.1. Random freezes varying wildly in frequency. I turned off ransomware protection - no difference. I am running fine after removing MB from the system. I am attaching the requested info from above. Over the past 2 days,I have run my system with individual protection modules disabled, and watched for lockups. on on off on Lockup "
on off on on Lockup "
To this 73 Yr old, retired Control Data mainframe Engineer, it would appear that the Web Protection module has issues. I realise how involved a software problem can be to fix. Good luck to your team as they try to pin down the problem. Anything else you want from me --Just ask. Yes, based on the reports I've observed so far it appears that in at least 90% or more of the cases where users are experiencing this issue it is due in some form or another to the Web Protection component, either having issues with some as of yet undetermined system component, system configuration/setting, or third party software/hardware component or a conflict with one of several third party AV products (Avast, Bitdefender, ESET, AVG, possibly Avira based on at least one report, possibly Kaspersky and possibly others). I have seen a small number of cases where the culprit was the Ransomware Protection component, however those issues seem to be much fewer in number compared to the incidents where the Web Protection component is at fault. There are many theories as to what the cause may be, especially where no third party AV is installed, however as a Windows 7 x64 user myself with a fully patched system I can attest to the fact that it does not impact all systems (I've had 0 incidents of freezing/lockups etc. with build 508 so far and I've been running it since the day of release) so I do not believe that the issue is related to any Windows Update and I suspect it is something much more obscure than that behind those cases, I just don't know what that is yet. I do know that this, along with many of the other issues frequently being reported with build 508 so far appear to be nearly if not precisely identical to issues that were found and fixed in previous releases of Malwarebytes 3 which makes me strongly suspect a regression of some kind in the code, however I have heard nothing from the team so far to confirm this hypothesis and they appear to be treating these issues as something new so that may just be a coincidence. I hasten to add that my other machine running MB Pro as well has no issues at all. I'm attaching a list of my installed programs - perhaps other lockup sufferers could supply the same and something common might be found. The above list didn't capture properly -sorry 'bout that. Here is a screen capture of my installed progs from the add/remove prog screen. No web browsers listed? Seems that list might be incomplete with regard to applications and services. In my case, I had a fresh installation of Windows 7.1 Enterprise, with a 'minimal' set of applications. Adobe CC is notorious for background network activity and services constantly checking-in with the Adobe mothership. Now I'm just letting the machine idle for awhile to see what happens. So, how many of us are running NVidia drivers? Most of freezes I had happens overnight when my monitor is off. I'm running NVIDIA here; GTX 1060 6GB (mobile/MXM version), driver version 417.35 released in December of 2018 on Windows 7 Professional x64 SP1, fully patched and have been running Malwarebytes build 508 since the day it was released and have yet to have a single freeze caused by it. <blush> -Yeah utorrent 2.2.1 -but I rarely use it on this machine. The other machine is a dedicated utorrent server (that's all it runs - 24hr/a day) And it's the machine that has no probs at all !! Thank you to everyone providing feedback and information on the issue. We are currently looking into the possibility of this issue being related to certain network adapters. Disable the Web Protection component. Revert to the previous components package version (1.0.482). See this post. Once the file is downloaded, open your Downloads folder or the location of the downloaded file. Double-click mb-support-#.#.#.###.exe to run the program. If prompted, place a checkmark next to Accept License Agreement and click Next. Click the Advanced menu on the left. Please do not click Start Repair. A file named mbst-grab-results.zip will be saved to your Desktop. Please attach the file in your next email reply. 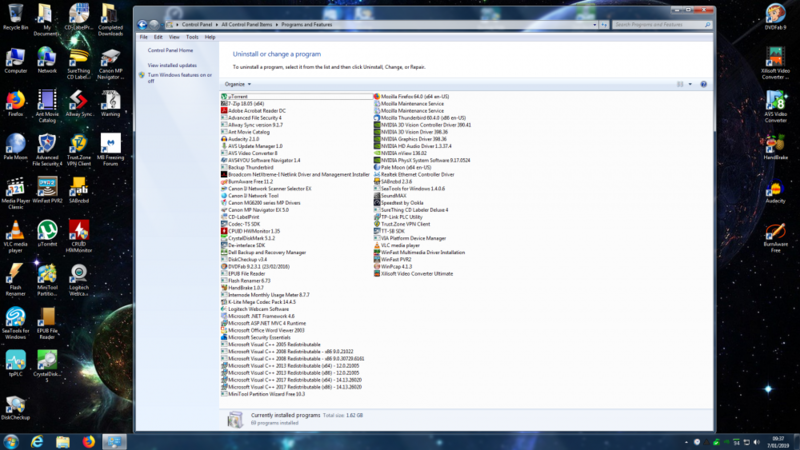 Hi I've been having the freezing issue on my Windows 7 computer since 12/10/2018. I see there's several forum posts on this issue, not sure which one holds the best info. One thing I learned in my troubleshooting was that disabling the network adapter (ethernet) so that my computer was offline would stop the freezing. Once the network adapter was re-enabled, it wouldn't be too long before the computer would freeze again. Also the freezing was not isolated to ethernet network adapters, since my computer froze when I tried going wireless too. I also tried uninstalling and reinstalling Malwarebytes but my computer still froze. I have removed Malwarebytes to stop the freezing. Is there anything I can provide to help without MBAM installed? As requested - good luck in the hunt. Please use the topic linked above for further discussion. Thanks again to everyone for providing feedback on the issue.